You’re told to have performance reviews with your employees. They’re essential to the success of your team and organization. But the old-fashioned annual review has lost its luster. Instead, you should be having regular performance conversations. These conversations are innately uncomfortable, but it’s OK. Your employees just want you to be open and honest with them. They want a coach, not a boss. There are many ways to approach these conversations, and we've got your back! 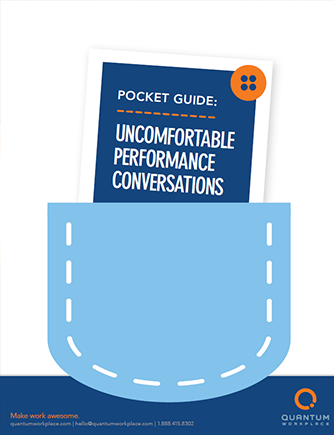 Our pocket guide contains simple and effective tips to help you prepare for, conduct, and follow up on your employee performance conversations.